For the 55th anniversary of the diplomatic relations, which will be commemorated in the year of 2018, the Foreign Minister of Mongolia and the Secretary of State for Foreign and Commonwealth Affairs of the United Kingdom have exchanged reciprocal congratulatory letters in where they have mutually expressed their commitments to further strengthen the bilateral relations and cooperation. In the letters, the Ministers have not only mentioned their satisfaction on the current state of the friendly ties but also expressed the enhancement opportunities and possibilities in the cooperation in many areas including the trade and economic sectors. The counterparties, moreover, have emphasized on the successful multilateral cooperation the both countries enjoy. the Cabinet Secretary of Great Britain, and exchanged views on the “GREAT” initiative activities and best practices. The State Secretry has mentioned that Mongolian government has also established a similar structure under the prime minister’s office. Mr. D.Walpol said since his trip to Mongolia in November 2016, the Initiative has produced a recommendations for Mongolia and has been communicating with the relevant department of the Ministry of Foreign Affairs of Mongolia. 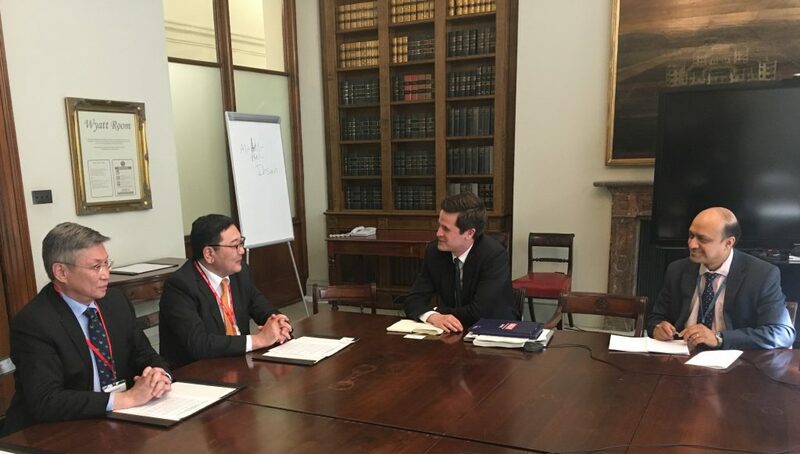 Mr.Davaasuren Damdinsuren met Mr.Simon MacDonald, Permanent Under Secretary and Mr Rick Shears, the Team Leader of the Asia Pacific Department of the FCO. 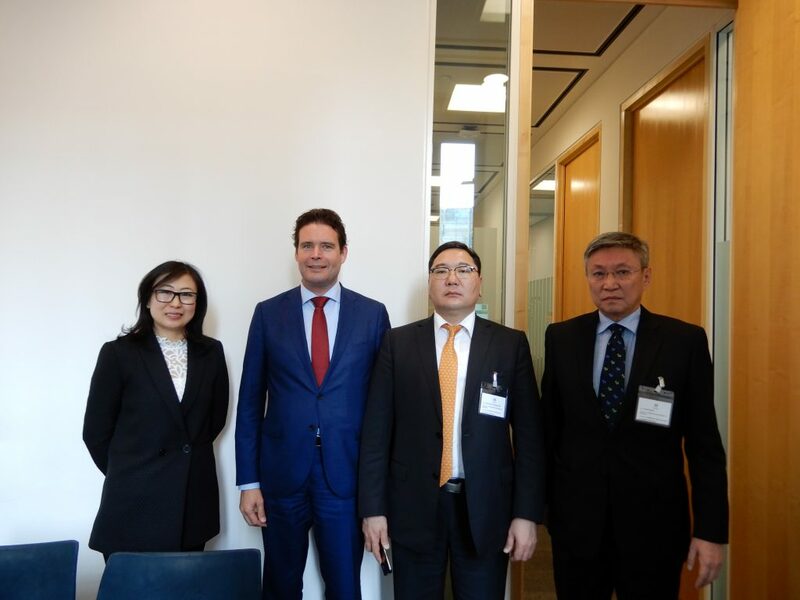 State Secretary Davaasuren said that implementing the “Third neighbour” policy, Mongolia highly values bilateral relations and co-operation with the UK. 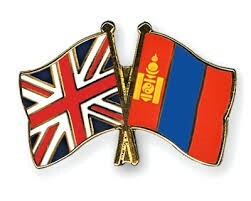 And interested in strengthening further political, social, trade and economic ties between the UK and Mongolia. Secretary McDonald responded that longstanding friendly ties between the two countries will further enhance and strengthening. 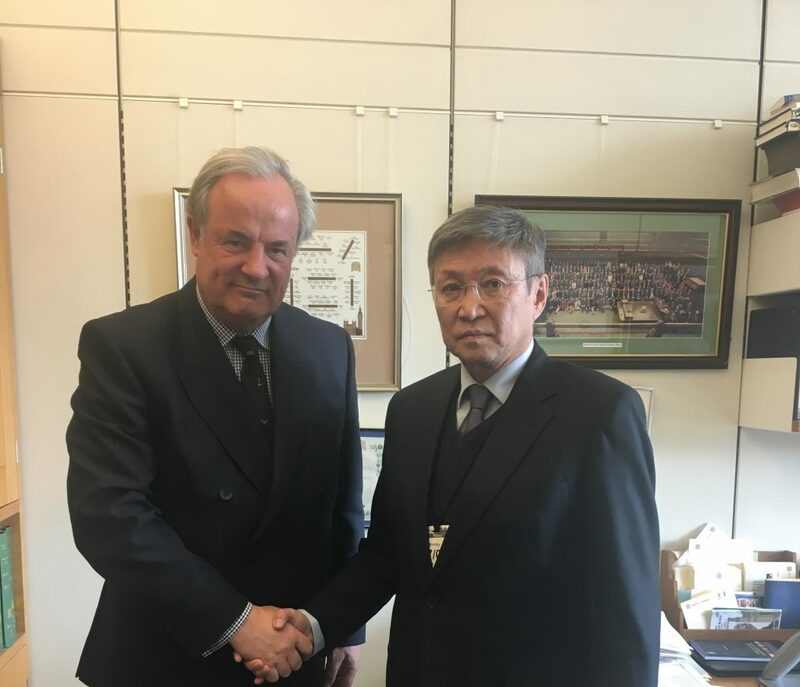 On 31 March 2017, Mr.Ts.Munkh-Orgil, Minister of Foreign Affairs of Mongolia has received Mr.Mark Garnier MP, Parliamentary Under Secretary of State at the Department for International Trade (DIT) of the United Kingdom. Among other issues, the minister and the Parliamentary Under Secretary of State have exchanged views on the current situation of trade and economic cooperation and explored possibilities to expand bilateral trade and economic ties and to increase investment. During his visit to Mongolia, Mr. M.Garnier, has met with representatives from the Ministry of Road and Transport Development, Erdenes Mongol LLC, Ulaanbaatar BUK JSC and rang the gong at the Mongolian Stock Exchange to open the market trading. 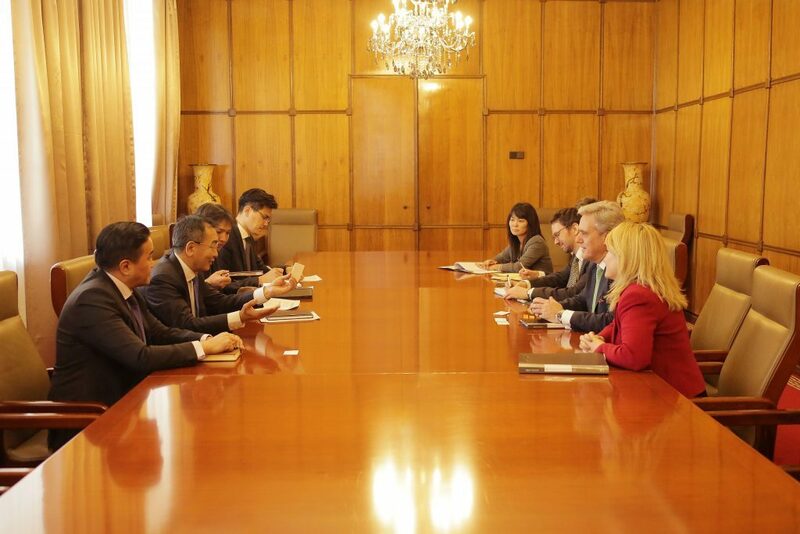 At the MSE, he has expressed his willingness to promote not only the cooperation of the two Stock Exchanges but also the UK based investment funds’ activities to Mongolia. H.E. 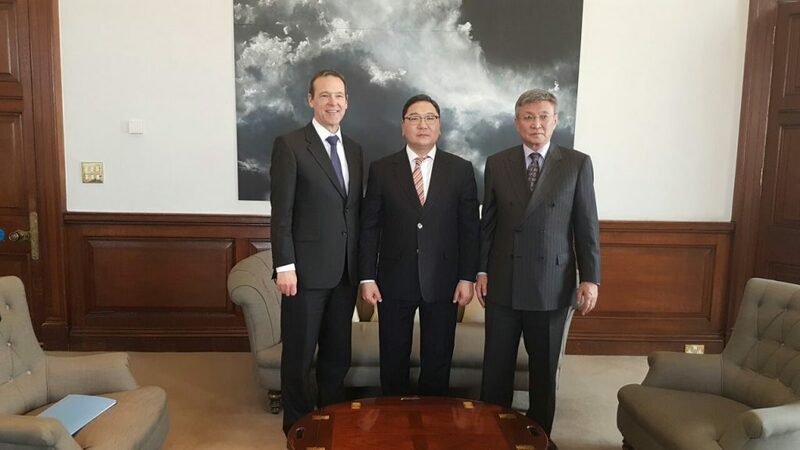 Mr. S.Bayar, the Extraordinary and Plenipotentiary Ambassador of Mongolia to UK has met with Rt. Hon. James Gray, Chairman of the British Mongolia All Party Parliamentary Group, at his office in Portcullis House on 27 March 2017. Ambassador S.Bayar has expressed condolences for the loss of lives in the tragic attack in London, near the Westminster palace on Wednesday. As himself had witnessed the situation from a short distance, the Ambassador also commended the swift and well-coordinated actions by the security, law enforcement agencies as well as the medical teams in post incident response. Rt. Hon. J.Gray has expressed the gratitude for the sympathy and congratulated the Ambassador for his appointment. As the chairman of the Parliamentary group, J.Gray stated his commitments to furthering of the friendly bilateral relations and looking for an opportunity to organize a “Mongolia Day” event at the House of Commons. Established in 2005, the “Forum for the Development of Mongolia” has become an annual event for Mongolians living abroad. The thirteenth Forum titled as “Mongolia’s Opportunities” and hosted at the Auditorium of the European Bank for Reconstruction and Development will be held on Thursday, 6th of April, 2017.
Business representatives from Mongolia, led by the Mongolian Business Database NGO will lead a session focused on ‘Business enterprise in Mongolia: Challenges and Opportunities‘. Distinguished researchers and fellows from Mongolia, Russian Federation, USA and Australia will present their studies related to Mongolia’s current socio- economic areas. The conference of the Council of Mongolians Abroad will be held during the Forum. The Forum is jointly arranged by the Embassy of Mongolia in the UK, Mongolian Association in the UK, Tsahim Urtuu Kholboo NGO, Mongolian Business Database and the Council of Mongolians Abroad and the venue of the event is generously provided by the European Bank of Reconstruction and Development. 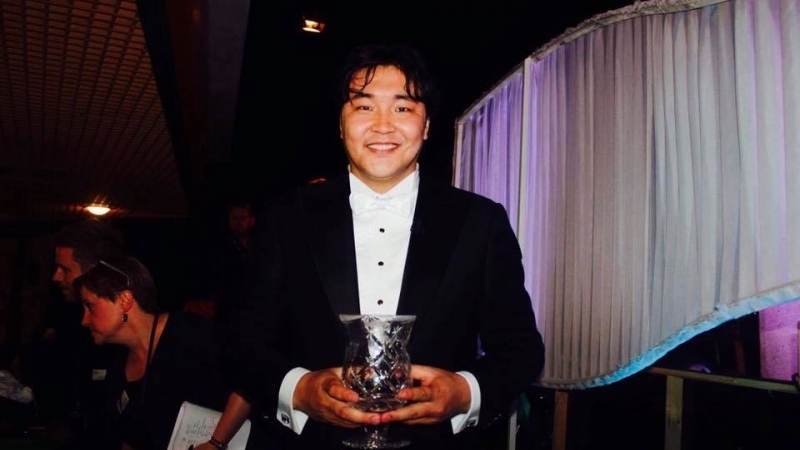 The Mongolian Association in Sweden provided a financial contribution too. Bloomberg TV Mongolia and Buddha Production are supporting as media partners. More information can be found at : http://md-forum.eu/mon/. Following the seventh regular State Great Khural (Parliament) elections, the newly formed Government of Mongolia has developed its Action Programme to be implemented for the period of 2016-2020, reflecting Mongolia’s Sustainable Development Vision 2030, Election Platform of the Mongolian Peoples’ Party, proposals from civil society organizations and citizens, as well as the relevant provisions of international treaties and conventions to which Mongolia is a party to. In this difficult time of economic and financial downturn, the main objective of the Government of Mongolia is to restore the economy within a short period of time, promote growth, support social sectors and significantly upgrade the well-being of its citizens. In addition, empowerment of the civil service, prompt, efficient and transparent delivery of public services by professional experts at all levels of administration, strengthening public trust, and enhancing national security are on the agenda of the Government. The full text of the Action Programme of the Government of Mongolia for 2016-2020 is available to read. Улсын Их Хурлын ээлжит 7 дахь удаагийн сонгуулийн үр дүнд шинээр байгуулагдсан Монгол Улсын Засгийн газар Монгол Улсын Тогтвортой хөгжлийн үзэл баримтлал-2030, 2016 оны Улсын Их Хурлын сонгуульд оролцсон Монгол Ардын намын сонгуулийн мөрийн хөтөлбөр, иргэний нийгмийн байгууллагууд, иргэд сонгогчдын санал, олон улсын гэрээ хэлэлцээрүүдэд үндэслэн 2016-2020 онд хэрэгжүүлэх үйл ажиллагааны хөтөлбөрөө тодорхойлсон билээ. Монгол Улсад бий болсон эдийн засаг, санхүүгийн хүнд нөхцөлд Засгийн газрын гол зорилт нь улс орныхоо эдийн засгийг богино хугацаанд сэргээж, өсөлтийг бий болгон нийгмийн салбаруудыг дэмжиж, иргэдийнхээ аж амьдралыг эрс сайжруулахад оршиж байна. Мөн төрийн албыг чадавхжуулах, бүх шатанд мэргэшсэн албан хаагчидтай байж, төрийн үйлчилгээг хөнгөн шуурхай, чирэгдэлгүй бөгөөд ил тод, нээлттэй үзүүлэх, нийгмийн итгэлцлийг бэхжүүлэн, улс үндэстний аюулгүй байдлыг баталгаажуулахад чиглэсэн тодорхой зорилтуудыг тус тус дэвшүүллээ. Та бүхэн Монгол Улсын Засгийн газрын 2016-2020 оны үйл ажиллагааны хөтөлбөрийг уншиж танилцана уу.